I’m very excited that I’ve found an environment that allows me to contribute as an artist and collaborate with a team of creative professionals. Horton Group, a full-service digital marketing agency in Nashville, TN, has hired Dan Wiley as Web Developer and Designer. In his new role, Wiley will employ his artistic talents to help visualize, build and launch websites for various client verticals. “After looking for a place to land, I’m very excited that I’ve found an environment that allows me to contribute as an artist and collaborate with a team of creative professionals,” says Wiley. After graduating from Frederick Community College with a degree in Digital Media Design, Wiley started working at Frederick Rock School teaching music theory and musicianship. 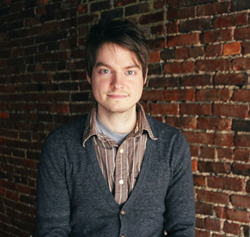 Concurrently, Wiley kept his skills sharp doing freelance development and design. Wiley's artistic passion and creativity come to fruition at Horton Group. Valuing typography and dexterity, he keeps his projects spruce and clean, making his workflow smooth and efficient. Wiley extends his hobbies across the artistic spectrum. He’s a songwriter and keyboard player for his band, also playing guitar and bass. His latest endeavor is focusing on the visual arts, including painting and drawing. Dan Wiley can be reached by calling Horton Group at (615) 292-8642. Horton Group is a full-service digital marketing and design agency headquartered in Nashville, TN. For 20 years, the agency has helped organizations in a wide variety of industries bolster their presence and business online. Using a team-based creative approach, Horton Group provides dynamic solutions in inbound marketing, website design and development, custom mobile applications, search engine optimization (SEO), social media marketing and more. Learn more about Horton Group by visiting HortonGroup.com.